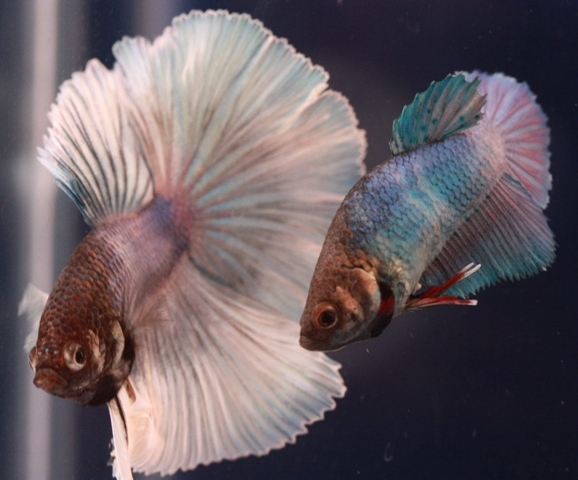 There are as many ways to breed bettas as there are breeders. And the US tends to do them a little differently than the Thai breeders. Which way is right for you? Best thing to do is start with what ever is easiest for you and change as the need presents itself. As long as you are meeting the basic requirements of the fish, you should be successful. Bettas are pretty easy to spawn. To start I am going to give the typical US breeding set up. You will need a container, a way to keep it at the proper temperature, something for the fish to build a nest under and some place for the female to hide. The container you breed your Bettas in can be anything that holds water. The first thing to come to mind for most people is a fish tank. Some people use 10 gallons and others 5 gallons. The drawback with the larger tank is often the female can escape the male to the point he forgets about her and breeding all together. So, if you try a 10 gal and have difficulty spawning, put a divider in it to reduce the space the pair use for breeding. A 5 gallon tank makes a great spawn tank and home for the fry for the first month of their life. Other containers often used are 5 gallon buckets and plastic totes from places like Wal–Mart. Both are inexpensive, and if they can be kept at the proper temperature, they make acceptable spawning containers. Other things I have heard used are bowls and even a clear plastic container a head of lettuce was purchased in. Again, if the fish are ready and the other parameters are met, these can be successful spawning containers as well. So you see, just about anything can work as the fish are not picky when it comes to where they are spawned. The next thing that needs addressed is keeping what ever container you use at the proper temperature. A good temperature range for spawning Bettas is 80*-84* with 82* being where most of us aim for. The most common way to keep the temp where it needs to be is with an aquarium heater. It is a good idea to set it and make sure it gets to the proper temp and keeps it there before introducing the breeding pair. It is not uncommon for a heater to malfunction and cook your fish so you want to make sure there are no problems before introducing your pair. Another way to keep the water temperature correct is with reptile heating mats. They need a thermostat to set the temperature, but do a good job, especially if you have several spawn tanks lined up across a shelf. For that many tanks they are economical as they last longer than your typical tank heater. Bettas are soft water fish. That means they want their gH to be on the lower side, not the pH. 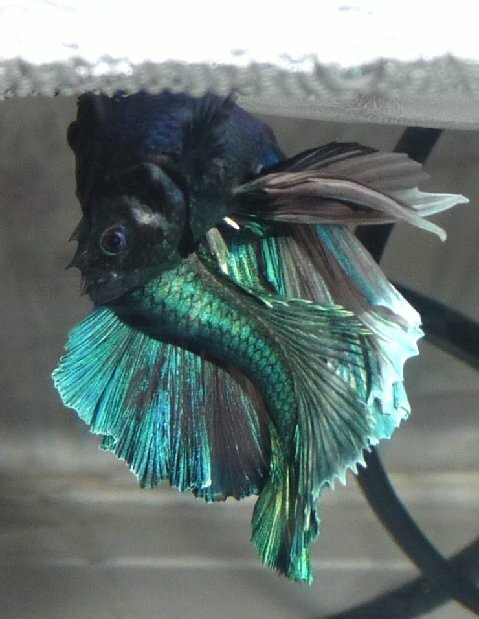 That said, many spawn Bettas in all kinds of water parameters. So the best thing to do is try yours and see what you get, then make changes from there. I recommend having a water test kit on hand for regular testing of your water so you can keep the water from becoming unhealthy.. and you can also see what kind of water parameters you have to start. If you have difficulty spawning and your gH is high, you may just need to get that a bit lower and everything will be fine. There are several different ways to naturally lower the gH. One of the most popular ways is using IAL or Indian Almond Leaves in the spawn tank. The higher your gH the more of the leaf you can use. My water is RO with minerals added back in and I only use 1/2 a leaf. The leaf will also give the male something to build a nest under. Another way to lower the gH and the kH is to use Peat Moss . Running your water through peat moss will lower both of these vales. You still need to use a water conditioner as there is still chlorine and chlorimines in the water that need removed, but the peat will lower both the gH and kH buy several degrees. OR, you could place some peat in a fine mesh bag used for filtration material and set that in the spawn tank to gradually lower those values. If your fish are ready to spawn and they are in water with the proper temp and parameters, they will go about spawning with no additional help. But most breeders will give the male a place to build a nest. 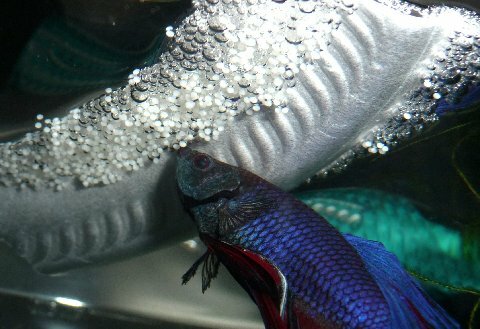 Bettas are bubble nest breeders. In other words, the male will blow a bubble nest at the surface of the water to place the eggs and young fry untill they are ready to move off on their own. Males will build them in open water but they do like a place to build them that has a bit of structure. I already mentioned using a piece of IAL on the water surface. Other breeders use half of a styrofoam cup taped to the side of the tank, a piece of Styrofoam plate, plastic Pringles lids, floating plants, wax paper or bubble wrap. What ever you have on hand that floats is fine to use. Some breeders put a few of these in a tank and let the male decide what he likes best. I prefer the small bubble wrap as it often gives clueless males an idea of what they are supposed to be doing. And, if they are not good nest builders, it gives them a place to put the eggs already pre made so to speak. IF you have more than one male and another has blown a nest you can use a spoon to transfer the nest to the spawn tank. The male in there will not have a problem using that as his own. I start with a clean tank/container. To that you want to add 5-6″ of water. If your water comes out of the tap, make sure you use water conditioner to remove the chlorine. Add your “structure” for the male to build a nest under and also something for the female to take refuse in if chased to much by the male. I have used both plastic and live plants as well as PVC couplings on the bottom she can hid behind or in. I then take a soda bottle, drill holes all along the sides, cut top and bottom off and place into the spawn tank as a sleeve for the female. I then put the male in at first and give him an hour to check things out. Then t he female goes into the sleeve. If you don’t have time put them both in but do it at night and let them hang together in the dark. The male and female should both eventually get excited and flaring at each other. I like to see some aggression in the female with her flaring back and coming at the male a bit before I turn her loose. If the female is dark you will see vertical bars start to show that shows her readiness to breed. Lighter bodied girls you just have to watch their behavior. What you want to see is some female aggression, not violent but enough to hold her ground against an aggressive male, and a submissive posture. Females are submissive when they start to face the male with a nose down posture. If they come right at them head on.. they are still flirting. May females will not adopt that posture till they have been chased a bit and accept the male and his dominance. This is normal Betta courtship. It is not unusual for both fish to get nips and torn fins during the breeding process. If you see excessive aggression and one of the fish is looking stressed it is time to sleeve the one getting beat up [yes, it can be the male] or remove them entirely and try another pairing or at a later time. When the female becomes submissive the pair will attempt to wrap. I say attempt as it sometimes takes a little bit for them to figure each other out, even if one or the other has been bred before. The male will eventually be able to wrap his body around the female. The female will release eggs and the male sperm during the wrap and the eggs will be fertilized as they fall through the water. the wrap will temporarily immobilize both fish and the kinda drift down and apart. The soon come out of it and start going after the eggs. Some are caught in the free fall to the bottom, others are picked up from the bottom. Ideally they will be picked up by both fish and placed in the nest. At times, one or the other will eat the eggs at this point. Bear in mind some eat unfertilized eggs and other just eat eggs. You have to determine this on your own and decide to allow the spawn to continue or try something different. Spawning can take several hours. When one or the other decides it is done, the male will be left tending the est and the female often goes to the opposite end of the tank. It is at this time you can gently remove her and place her into clean water to rest up. You want to use care not to disturb the male or the nest as often he will eat the eggs in response. I fine fish I have bred tolerate me a lot more than a fish I have brought into my fish room. If I cant get the female I just wait until I can. The male will keep her from the nest and in time you should be able to scoop her up. Give her something to eat and watch for infection if she sustained any wounds. If there is fin or body damage a little salt or methelene blue in the water can prevent bacteria from taking advantage. My rule of thumb is after spawning it will be two days till eggs hatch, then two days untill fry free swimming. When the eggs hatch the fry will hang tail down and the male will tend to any that fall, or at least he should. Some spawns are so large he may not be able to keep them all in the nest, but that is not the norm. While the fry hand tail down they are using the egg sack they were born with. The day after you get fry hatching is a good day to set up Vinegar Eels and/or brine shrimp for harvesting as first foods for the fry. The fry have a natural reflex to snap at and eat things that move when they get free swimming. As soon as I start to see some of the fry become horizontal I like to add the vinegar eels. They stay alive in a water column for a while and it gives the fry something small to start snacking on. Remember the spawn took several hours so you will have fry maturing and becoming free swimming over a period of time. So, when to remove the male? I try to keep an eye on the spawn and if Dad is doing good I wait until most of them are free swimming and he is trying to keep them rounded up. Then I remove him and feed him well. Do not be surprised if he seems to go in a funk. I think they have a little withdrawal when removed from parenting duties but should return to old self in a few hours. If at any time the male appears to be snacking, out he comes. I have had eggs hatch and raised fry to adulthood without any male. I saw egg eating and promptly removed him. Eggs developed just fine on their own and became free swimming as well. After that they were like any other spawn. To get your babies off to a good start I prefer to feed vinegar eels for three days. On the evening of the third day I add a feeding of baby brine shrimp and monitor water quality. If ammonia or nitrIte anything but zero we carefully do a water change, as much as needed to return water parameters to zero. From then on for the next three weeks my fry get a morning feeding of various micro worms and an evening feeding of the bbs. When fry are at one month of age they can handle Grindle worms. They will get those along with the bbs and micro worms. I continue to feed the various micro worms as there will always be smaller fry that can not handle the bigger food and this keeps them growing. Plus the fish like to snack on them and graze on them all day. A small pellet is also introduced at this age.